Adventures in Egypt and Nubia, the Tales of William John Bankes (1786-1855) by Dr Patricia Usick (ISBN 0 7141 1803 6), tells the story of the pioneer Egyptologist William John Bankes (1786-I855). A brilliant and volatile man, Bankes was the unexpected heir of the Kingston Lacy estate in Dorset, whose passion for exploration and discovery was surpassed only by his energy in investigating and recording. 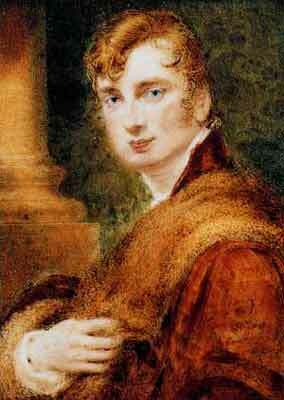 Handsome, rich and confident, Bankes studied at Trinity College, Cambridge, where he met Byron who became a lifelong friend, before setting out on the Grand Tour. A period spent in Spain and Portugal was followed by travels in the Near East, where a chance encounter with the Swiss explorer J. L. Burckhardt would inspire Bankes with a desire for serious archaeological research, far beyond the more leisurely pursuits of the average gentleman-traveller. 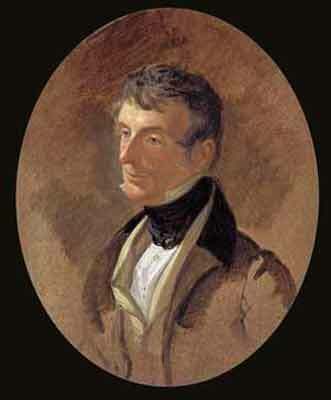 During the years 1815-1819 Bankes criss-crossed Egypt and the Near East amassing a vast portfolio of notes and manuscripts, as well as drawings by his own hand and the artists who accompanied him on his travels. The accuracy and detail of Bankes' collection makes it an invaluable record of ancient monuments now lost or damaged. His extraordinary discoveries were a revelation to contemporary scholars and proved instrumental in the race to decipher Egyptian hieroglyphics. Lionized by his own generation as 'the Nubian Explorer', Bankes' achievements would become shrouded by scandal, as events in his private life conspired to disrupt his work, parliamentary career and plans for publication. An affair with a married woman was followed by a libel case and two arrests for homo-sexual offences, forcing Bankes to flee England for exile in Italy. His art collection and the obelisk he had plucked from the temple of Philae were left behind at Kingston Lacy, where his notes and drawings also languished in a cabinet, unpublished and forgotten. The book tells Bankes' story, describing his travels in detail and assessing his contribution to Egyptology. 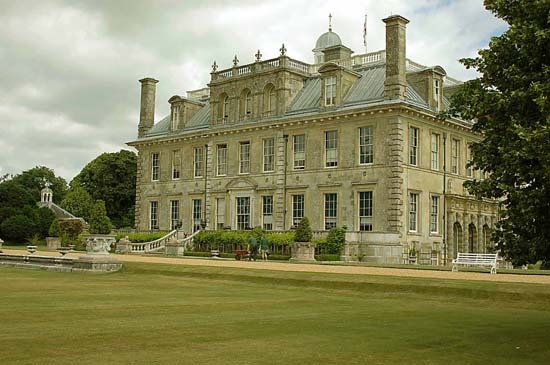 The National Trust, took over Kingston Lacy and its estates in 1981. The Dorset Public Records Office (in Dorchester) hold the Bankes Egyptian portfolio. The Kingston Lacy House, which is open to the public, has very few artefacts on display and photography is not permitted. The house does have an extensive art collection, some collected by William John during his travels. The King-list from the temple of Ramesses II (also known as Ramesses the Great and Ozymandias) at Abydos. 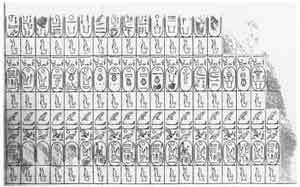 Drawn by Bankes and used as the frontispiece for Salt's book on hieroglyphs. Shelly's couplet is similar to Diodorus's writing (the only classical author to mention Ozymandias) - Shelly, Banks etc were classical student. Diodorus wrote "I am Ozymandias, king of Kings. If anyone would know how great I am and where I lie let him surpass any of my works". He also wrote that the statue of Ozymandias was "... the biggest of all those amongst the Egyptians". It is accepted that the name Ozymandias is derived from Usermare - Ramesses II. Bankes found the temple 12 miles south of Kalabsha (which was relocated Khartoum to save it from the rising Lake Nasser), close to the river's west bank. It was adjacent to the low cliff and was surrounded by the ruins of the ancient town. Built by Augustus over an existing shrine and was dedicated to two local deified brother - Pedesi and Pihor sons of a local Nubian chieftain (their titles suggest that they drowned) from date after the 26th Dynasty. Drowning was a venerated death and this put them among the deities worshiped. A terrace and monumental pylon led to the main temple with its successive chambers of the Pronaos, the vestibule and the sanctuary, which concealed a crypt. Bankes had broadly plotted the temple in 1815 and added detail in 1819: a ceiling decoration of alternating winged vultures and cobras, the north door which, while well cut, was certainly not in the original plan and remains of paint on the cornice of the pylon. He observed that the terrace could not have been a quay since the river had never reached up to it (this fact, and his view that the damage to the pronaos resulted from its conversion to a church, are agreed by the report of the Centre d'Etudes et de Documentation sur l'ancienne Egypte (CEDAE). Bankes believed the terrace area might have been a burial ground and suspected that the rear rock-cut chapel had been a tomb as there was a row of small tombs nearby, one with a stone mummy case and uninscribed lid. He sketched the pattern on the column bases and drew the sphinxes on the drums. The reliefs were `not of the best & lightest sort, yet better than Kalapshe [Kalabsha] and possibly earlier. The twenty-six drawings hold details of missing reliefs and some interesting architectural information including remains of what he considered the church conversion and a perhaps previously unrecorded structure near the end of the terrace. Several drawings shed light on the exterior part of the mysterious rock-cut chapel behind the temple. Bankes appears to be the only source giving measurements for this external anteroom, which, like the interior chamber, he found uninscribed. This curious small undecorated chapel, containing a hollowed-out bench, was cut into the cliff behind the rear wall of the sanctuary of the temple. There were traces of a construction in front of it, but whether it had ever been joined to the temple could never be ascertained, even when the foundations of the temple were examined. It is not on the main axis of the temple and may have been the original shrine. Its door had been restored and strengthened when the temple was built. Bankes noted that the built section of this 'grotto' seemed to have been constructed later than the excavated part. On the stela in the sanctuary, Pedesi and Pihor are said to be 'entombed in the Holy Hill' so perhaps this was their tomb with the temple as their funerary chapel.' When the temple was restored and consolidated in 1908-09 by Barsanti, he only partially rebuilt the chapel's antechamber as many of the stones of its walls were missing. The temple was fully published by Blackman in 1911 and during the UNESCO rescue in October 1962, dismantled and extensively documented by CEDAE.